dm Server 2.0.0.M5 is now available and can be downloaded from here. We’re getting towards the end of the 2.0.0 release cycle so most of the work in this milestone is focused on locking down the user interaction model. Take a look at the M5 release notes for the full details of what we’ve been working on. Please keep your feedback coming as comments on our blog, in the forums and on JIRA. Please also watch the blog for detailed posts on many of the new features referenced in this New and Noteworthy. Properties files can now be deployed in either the pickup directory or in any configured repository. The content of these files is then accessible in OSGi’s ConfigurationAdmin at a PID specified as the file’s name without the .properties extension. Plans can now have globally defined attributes used for substitution. Artifacts within plans can have properties defined which are translated into Bundle manifest headers at deployment time. The Artifacts page of the admin console has been spruced up to render the dependencies of user installed artifacts as trees. In addition, each level of these trees is lazily loaded improving load-time performance. dm Server now ships with a command line shell to replace the Equinox console that was previously used. This console is accessible locally with the -shell startup command. <SH0001I> dm Kernel ssh shell available on port 2402. @@@ *****            .__. .__. .__. .__. Type 'help' to see the available commands. You can also access this command line shell via SSH using the same login credentials that are used for web and JMX access. We’ve also made some changes to various parts of the infrastructure of dm Server. 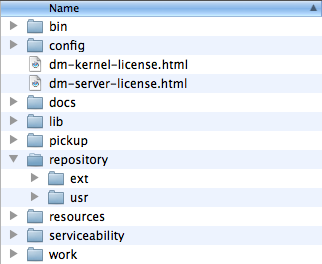 First, the repository area has been simplified to only have an ext and a usr folder. The usr folder is configured as a watched repository meaning that you do not need to restart the server to reference bundles that have been added there. The config/ directory has been flattened and the credential store and keystore have been moved. The keystore now resides in config/keystore. 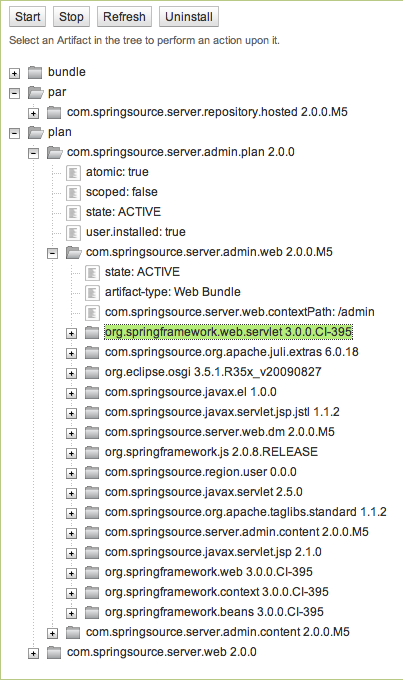 The credential store now resides in config/com.springsource.kernel.users.properties and specified users and roles in a properties file format. Last but not least, the dm Kernel is now a standalone runnable distribution. You can build a zip package from the source code directly or download from here.